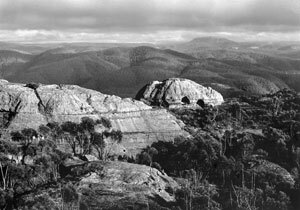 The Nattai is a romantic landscape of massive sandstone escarpments, such as Grant Head and Golden Moon Bluff. Yet in spite of the towering cliffs, the Nattai is accessible and its recreation value is enhanced by its proximity to Sydney, so that Starlights Trail and other access points into the Nattai Valley continue to be well used. The wilderness lies within the uplifted south-west sector of the Permo-Triassic Sydney Basin south-west of Picton. East of the Wollondilly River, the Wanganderry and Nattai Tablelands of massive Narrabeen and Hawkesbury sandstones 180-220 million years old cover the majority of the park. Permian sedimentary rocks are exposed below the sandstone in the beds of the Nattai, Alum, Little and Wollondilly Rivers. These tablelands, with the intervening gorges, cover a wide range of climatic conditions, soil types and topographic habitats. The vegetation which has developed under these conditions is equally diverse, especially as there is a marked rainshadow to the west. The Nattai Valley is renowned for its majestic River Oaks (Casuarina cunninghamiana), a gallery forest which follows the river for most of its length. On the richer alluvial soils good stands of Deanes Blue Gum (Eucalyptus deanei) have developed, and the rare Camden White Gum (E. benthamii) occurs along the Little River near its junction with the Nattai River. 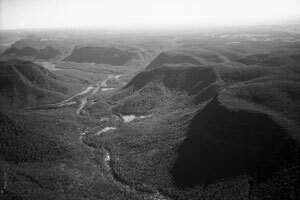 Nattai National Park, reserved in 1991, was the fourth and last division of Myles Dunphy’s Greater Blue Mountains National Park to be protected and is now enshrined in the Greater Blue Mountains World Heritage Area. Myles initially visited the area in 1916, the first bushwalker to go there. In the mid-1920s conservation efforts began somewhat naively when Myles Dunphy wrote to the Forestry Commission suggesting that the tall forests of the 15 kilometre long Couridjah Corridor be protected. This spectacular Blue Mountains’ canyon contains a Blue Gum forest, and provides access without the effort of a major descent from its entry point downstream of Thirlmere Lakes. The forestry people lost no time establishing a sawmill crew in the Nattai and over the next ten years much timber was removed but since then the Blue Gum forest has recovered much of its majesty. 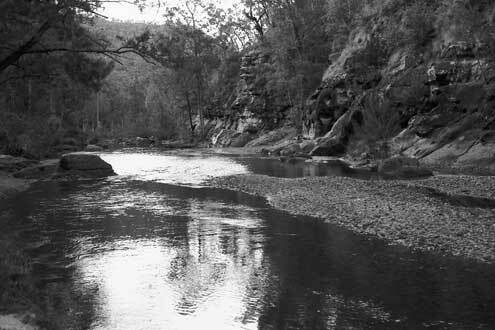 Fortuitously the reservation of the Warragamba Water Catchment in 1942 offered a level of protection to the Nattai Division of Myles’ Greater Blue Mountains National Park. In the 1960s and 70s the National Trust and the National Parks Association of NSW renewed calls for a reserve, while nearby coal mining caused a damaging 600,000 cubic metre cliff fall alongside Lake Burragorang and development pressures mounted. A hard rock quarry at Mount Flora to the south was proposed in 1976 and urban expansion began to leapfrog villages from Thirlmere to Hilltop. In 1984 plans were being drawn up for a Mittagong bypass over the Nattai River and a shooting range was relocated in 1986 to Wattle Ridge in the proposed park to make way for the freeway. In response to these threats, the Colong Foundation and Total Environment Centre commissioned a Nattai National Park proposal just in time to be caught up in the 1988 state election. Endorsements for the proposal were readily secured from two leading local NSW Parliamentarians – Robert Webster, the Member for Goulburn, and John Fahey, Member for the Southern Highlands. While the campaign failed to stop approval of the quarry, it did strengthen community support for a wilderness national park and gained considerable political attention. In April 1990 Environment Minister Tim Moore announced that Cabinet would consider the Nattai wilderness proposal, and in May, Opposition Leader Bob Carr threw out a challenge by stating that the Nattai would be part of a Labor Government’s next round of parks. Milo Dunphy suggested to Dr Terry Metherill who held the balance of power over the Greiner Government in September 1991, that a new Nattai National Park should be the first issue on his agenda. Dr Metherell heartily agreed. Tim Moore enthusiastically developed Metherill’s scheme and secured all the remaining public lands between the Nattai and the Blue Mountains National Park on November 15th with a 65,000 ha Nattai National Park incorporating a 29,824 ha wilderness, and four new State Recreation Areas totalling a further 30,000 hectares. Nattai was the first wilderness declared under the Wilderness Act, 1987 and assessment procedures have since been refined. 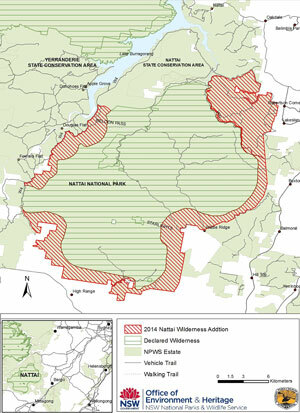 Wilderness additions were proposed in 2004 to bring Nattai up to current standard and water supply catchment management of the proposed wilderness ensured there was little obstacle to this expansion. In 2014, Nattai was extended by 11,440 ha by Environment Minister Robyn Parker, continuing bipartisan wilderness support. The Nattai exists due to the efforts of visionary conservationists like Myles and Milo Dunphy, and behind the scenes stalwarts like Alex Colley. We are so lucky to have such precious wilderness, but they can vanish in a moment. Nattai is again threatened by flood inundation by a proposal (that was originally rejected over twenty years ago) for raising Warragamba Dam wall that has been revived by the current NSW Government. The bluewood smoke from our cookfires drifted in tenuous strata between the trees, the sunlight slanting down, mostly over the stream, made the place a fairyland … It really was paradise. The constantly changing views in the narrow, gradually deepening canyon were marvellous. The strange fact was that very few people knew anything about the place. Only a few walkers like ourselves appreciated the striking beauty of this narrow strip of bushland and the line of canyons which contained it, or even the larger-scaled Nattai Valley itself. Keith Muir is the Executive Director of the Colong Foundation for Wilderness and has also worked as a senior campaigner for the Total Environment Centre. 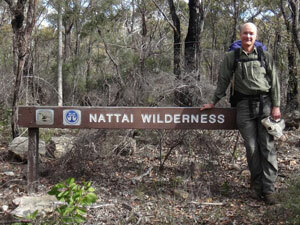 Keith has been at the centre of wilderness campaigning in New South Wales for many years. During his time the NSW wilderness estate has grown to over two million hectares, the Blue Mountains was inscribed onto the World Heritage list of properties and countless threats to these areas overcome. He has been awarded a Medal of the Order of Australia and a Centenary Medal for his services to nature conservation and the environment.